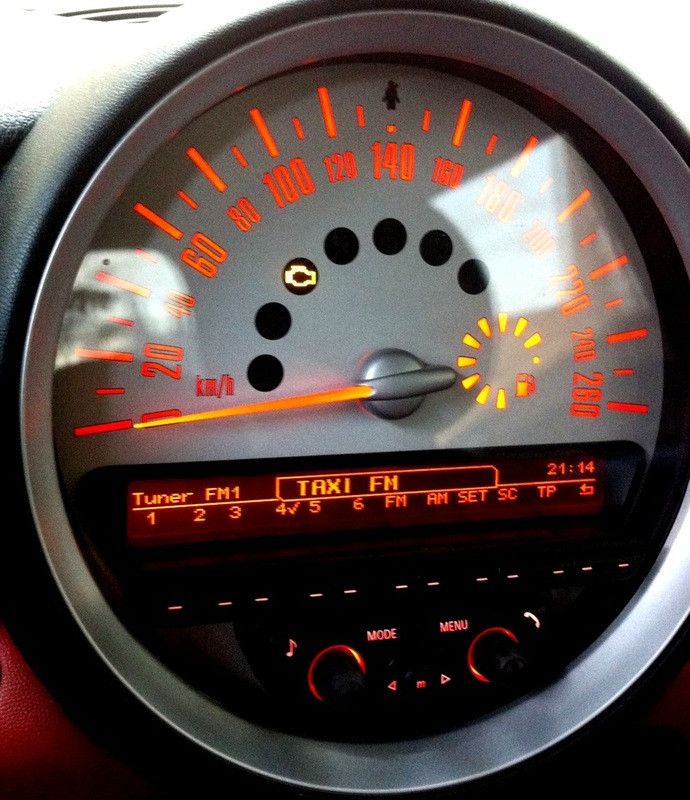 The 2nd generation MINI S models (R55, R56, R57, R58, R59 Cooper, Clubman, Convertible, Coupe, Roadster) with the N14 and N18 turbocharged engines, have a habit of showing the “Reduced Power” fault light and going into a fail-safe mode that allows the engine to run, but at substantially reduced power. Many owners (as well as shops, unfortunately) are confused on the purpose of the Reduced Power warning. 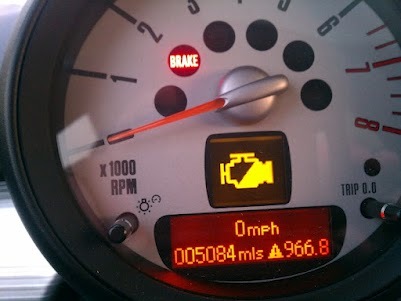 The Reduced Power fault warning is different from the “Check Engine” light. The Reduced Power warning is displayed in the steering column instrument display, as an engine image with 1/2 filled in yellow. The Check Engine light is displayed in the main center cluster, as an engine symbol. These two symbols/warnings are not the same. The Check Engine light (which, in this case, is an image of an engine, but is also commonly represented as the words “Check Engine or “Service Engine Soon”) is an indicator that an OBD-II (On Board Diagnostics-II) fault code has been generated and stored, that is deemed to be emissions related. The fault may or may not cause obvious engine operation issues. OBD-II fault codes are required as a part of the US emissions laws. A common OBD-II fault code reader will ONLY read the required OBD-II fault codes that are generated when the Check Engine light comes on. The Reduced Power light indicates when the engine management system detects a fault that is far enough out of parameters to cause the system to “protect itself” by reducing power output. These faults are recorded in the system, but are not accessible with a common OBD-II fault code reader. If the Check Engine light has come on as well, there will be an OBD-II fault code recorded in addition to the non-OBD-II code (that caused the Reduced Power light to illuminate). If there has been no Check Engine light, there will be no OBD-II codes generated. We have found that the most common Reduced Power faults are the 2884 and 2885 codes (there certainly are others, but we will address these codes in this article. ). Both of these codes have to do with turbo boost. In most cases, the system is not producing as much boost (intake system pressure) as expected (under-boost) or is producing more than expected (over-boost). * Intake leaks - Leaks in the intake plumbing between the turbocharger and the intake manifold. Cracked pipes or loose fittings can leak boost pressure and reduce the boost. * Worn turbocharger wastegate - A worn turbocharger wastegate will not seal properly and allow exhaust gasses to bypass the turbine wheel, resulting in lower turbine and compressor speeds and lower boost pressures. * Turbocharger wastegate vacuum controller - The vacuum canister controller can stick or have a vacuum leak, preventing it from fully closing the wastegate. * Turbocharger control pressure converter - The pressure converter controls the vacuum to the wastegate vacuum control canister via electrical signal from the engine management system. A faulty pressure converter can cause the wastegate to not be closed properly. * Vacuum tank and lines- The vacuum tank is a vacuum reservoir for the turbocharger vacuum controlled pressure converter and wastegate controller. A vacuum leak in the tank or any of the vacuum lines can prevent the wastegate from closing properly. * Defective Diverter Valve - Also known as the blow-off valve, this valve diverts pressurized intake air back to the inlet side of the turbocharger when the boost is too high, such as when the throttle is closed in the middle of acceleration. A defective or leaking valve can prevent proper boost from developing. * Catalytic converter - A partially clogged catalytic converter can create exhaust back-pressure which slows the flow and velocity of the exhaust gasses through the turbocharger, which then creates lower boost. While clogged cats are not all that common on a well running engine, in this case, the the higher rate of oil that runs through the PCV system on these engines, eventually makes its way to the cat, in addition to creating the carbon build-up in the intake ports. *Carbon build-up - The N14 and N18 engines build up carbon deposits in the intake ports and the backs of the intake valves. These deposits can get quite substantial and can impede the intake air flow. The deposits must be removed periodically via media blasting with walnut shells. Click HERE for more info and a DIY on this issue. Note that the DIY talks about the BMW N54/55 6-cylinder engines, but the principle is the same for the MINI N14/18 engines and BAVauto® does offer a kit for the MINI engines. * Turbocharger wastegate - If the turbocharger wastegate is not opening fully or properly, too much pressure can be developed in the intake system. * Defective Diverter Valve - Also known as the blow-off valve, this valve diverts pressurized intake air back to the inlet side of the turbocharger when the boost is too high, such as when the throttle is closed in the middle of acceleration. A defective or stuck-closed valve can cause too much boost and intake system pressure to be developed under off-throttle or other conditions. * Turbocharger wastegate vacuum controller - The vacuum canister controller can stick and cause the wastegate to not open as it should, creating an over-boost condition. * Turbocharger control pressure converter - The pressure converter controls the vacuum to the wastegate vacuum control canister via electrical signal from the engine management system. A faulty pressure converter can cause the wastegate to not be open properly. Finally, in addition to the above common faults, we have found that the 2884/2885 faults can be generated if lower octane fuel is used and the engine is run aggressively. So, before performing any other diagnostics or parts replacements, be sure you are running at least 89 octane fuel (91 preferred …. and this does allow higher boost and, hence, higher horsepower). BAVauto® can help you with ANY parts that you may need for these issues or others on your MINI. Just call our Advisors at 800-535-2002 or visit our online store at www.BAVauto.com.